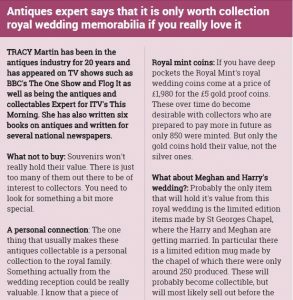 Antiques and Collectables Expert Tracy Martin loves a Royal Wedding and with good reason too because some of the Royal Wedding Memorabilia is well worth collecting. Today she spoke to the Sun newspaper to explain why some items are now worth £100’s of pounds. Many people will be kicking themselves to think they have chucked out items seemingly worthless to discover they are worth something. The MD of Tidy Management Sylvia Tidy-Harris did exactly that a couple of months ago with all sorts of Royal Memorabilia her mum had in a cupboard when she was helping her mum to house. Not only is Sylvia’s mother going to murder her when she hears what they are worth but her client Tracy is likely to do the same. So whilst Sylvia dons a tin helmet please have a read of what Tracy had to say. The Royal Wedding memorabilia now worth hundreds of pounds – do you have any in your home?